The biggest snowstorm to hit the east in my memory has finally abated. The game began last Friday and finished around 11pm local time Wednesday night. The score? Kharmin 2, Mother Nature 1. The first wave, we overcame easily enough. We had all weekend to dig out and by Monday we were able to get to wherever we needed to go. Even though the snow emergency routes weren’t cleared as well as I thought they should be, I was still able to get to work and home again without incident. Tuesday afternoon, the second half of the game began in earnest. Mother Nature really must’ve had some inspirational half-time speeches because she blew in with a vengeance. I was able to snow-blow the driveway that night, but the darkness made it too unsafe and I retired for the evening. Still, every few hours I had to dig the heat pumps out from the drifting snow. Mrs. Kharmin helped, too, and it was a back-and-forth battle. Wednesday, she kept blowing snow. I had expected to be able to get up and out of our driveway, but Mother Nature wouldn’t hear of it. After progressing to the top of the driveway once with the snow blower, I decided that we should just resign and call in our plow-guy on Thursday after the storm. The arrangements were made and the score was tied 1-all. The sun peaked out right on schedule Thursday morning, so I decided to give the snow blower one more crack at the driveway, hoping that once cleared the sun would melt the remainder and make our driveway dry. Cresting the top of the hill, my machine and I would not be denied (although we had to manually shovel a 15 foot long path near the top) and we persevered! A late come-back play netted our victory over Mother Nature. To celebrate, Mrs. Kharmin, my daughter and I took the truck and headed out to McDonald’s (and no, they didn’t ask if we wanted fries). Tomorrow, Friday, is the last day of the week. Mrs. Kharmin’s office might still be closed and I’m fairly sure our daughter’s school will be as well. Me? I intend to strike out and test those snow emergency routes and return to the office. I think I need a vacation from being stuck at home. Pffft! You Call This A Blizzard? During the weekend here on the east coast we experienced what the experts termed a “blizzard.” Loosely defined, a blizzard is, “A violent snowstorm with winds blowing at a minimum speed of 35 miles per hour and visibility of less than one-quarter mile for three hours.”, so I suppose that I can accept their hype. Saturday morning, around 7am, I started by digging out the heat pumps. They are on the windward side of the house, thus bearing the brunt of the drifting snow. Having already dug them out once at 11:30pm the night before, I thought the job wouldn’t be so hard in the morning. The “blizzard” gifted me with an additional foot of snow around the heat pumps– a foot beyond the foot I had already shoveled the night before. Next, the driveway. Four hundred plus feet up an incline of about 30° once past the pad by the garage. This is why we bought the snow thrower years ago. A Yard King 33″ wide, 12hp beast of a machine, capable of handing snowdrifts in excess of three feet. The initial foray from the safe confines of the garage (where the outlet is, you know, for the electric starter on the snowblower? Yeah, like I’m hand-cranking this thing.) was arduous, however it was very much throwing the snow. The pull up the driveway though proved to be a far different scenario. The heavy snow proved too much for my beast to drive through. Mrs. Kharmin came out with our daughter (who, for a time, entertained herself with her sled down the part of the driveway hill that I had been able to mostly clear to this point before making her aforementioned comment and retiring back inside the house) and she helped to clear a path wide enough for the snowblower– the plan being that once up the hill gravity would help drive the machine back down through the snow. Four hours later we found success in our endeavor and cleared a path wide enough for a vehicle to pass. Unfortunately, during that four hour trial an additional four inches of snow fell, re-covering our efforts. Figuring that the snowblower could handle a measly four inches, I returned to the bottom pad to clear the snow that had been ignored during the assault on the hill. Defeated, I retired to the garage after only 10-15 minutes of that work, however I had cleared enough to get both of the vehicles out of the garage if necessary. Normally, with five or so inches of snow or less, I hardly consider clearing the driveway as both my truck and Mrs. Kharmin’s Tahoe have four wheel drive and can handle it. This time, with snow still falling, we called in for additional help and paid a local with a bigger truck (and a plow!) to finish the job that I was, by now, too exhausted to accomplish. By Sunday afternoon, we were dug out. Now, it’s Monday. Both Mrs. Kharmin’s work and our daughter’s school are closed today, but I decided to brave the roads with my truck. Funny how roads marked as a “Snow Emergency Route” were in pretty sad shape. Several trees had fallen across the road, partially blocking them. Snow plows just went around them– one was marked with a road-worker’s reflective vest lying atop the mound of snow. It’ll probably take a few days for crews to make some semblance of order on the secondary roads… just in time for the next wave which is predicted to drop an additional 8-10 inches in two days. Has it come down to this? Are we all finally so lazy that we are unable to make choices for ourselves without someone prompting us? Yesterday, I stopped at a McDonald’s restaurant, close to my daughter’s school. I hadn’t had breakfast, so I decided to make a quick run through the drive-thru (see? I’m lazy already.). At the speaker where I am to place my order, I was greeted by a friendly, pre-recorded voice which welcomed me to McDonald’s and inquired if I were interested in a hot, mocha-latte? Then, the actual order-taker-person spoke up and asked to take my order after which he tried to tempt me with a hot apple pie (actually, two… they’re only $1!). No, thank you. I ordered what I wanted to order; no more, no less. Ok, I completely understand capitalism and the harsh times of the current economy, but does McDonald’s really need to squeeze out that last dollar from me? Heck, they’re lucky I have the money that I do have to order my meager Number One, Egg McMuffin value meal (value? Ha!) with a large Dr. Pepper– no ice. This is one aspect that makes people dread shopping for a car, new or used — ah, sorry I meant “previously owned.” They try to sell you on the options packs, those bundles of nuances that really make the car your car. Nevermind that they tell every other prospect the same sing-song. Small electronics? Major appliances? Just try shopping for them without the stress of the decision on the extended warranty. If they are so hung up on how great their product is, it shouldn’t require an extended warranty! No, I don’t want your mocha-latte. No, I don’t want your apple pies, as un-American as that may sound. I don’t need you to tell me what I want. And I certainly don’t need some mass-marketed, fast-food chain jockey pushing product for their quarterly quota. You can keep your fries. Really. 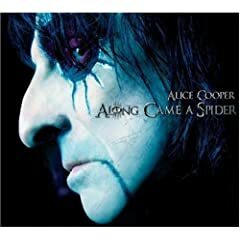 Giving Alice Cooper’s Along Came A Spider album another go. Released in 2008, it is not typical Alice in my highly unprofessional opinion; I tried it once and couldn’t get back to it. However, I thought I’d drop it on my iPod and run it on repeat for a while to see if any of it sinks in. Most albums that pass this muster stay on the iPod for future listening… ones that don’t, well, let’s say that the Microsoft Recycle Bin is much more forgiving than I am.